Gone are the days when you had to live with the tattoos you didn’t like anymore, courtesy laser technology. According to a poll, 50 percent of tattoo enthusiasts do not like their tattoos after some time. The reasons can be many: changing priorities in life, changing body shapes, loss of interest, and the likes. 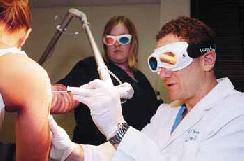 But now with the help of lasers, doctors can surgically erase your body art which doesn’t whet your appetite anymore. All it takes is a little patience and a lot of money. The laser beam breaks the tattoo ink into smaller fragments, which are shed along with your dead skin gradually.